One Situation that is a vital National Security Interest of the United States is the Gulf of Guinea. Between 25 and 30 Percent of the Oil Imported by the United States comes from this Region. Other Concerns are Piracy, Narco Trafficking and Human Trafficking. So what is the Defense Department doing about these issues this year? In Recent Weeks there have been several high profile incidents in the Gulf of Guinea Region. The most noticible one was the Raid on the Capital of Equatorial Guinea that has been believed to have been committed by Nigerian Militants. The Nigerian Militants themselves have been keeping a relatively small profile by committing very few acts of Kidnappings and Sabatoge aganist the Nigerian Oil Industry. Over this past weekend there was a Reported Terrorist Threat against the US Embassy in Nigeria. The State Department has responded in kind with a Travel Warning. A Final Demarcation Line regarding the Bakissa Peninsula is to be determined Next Year. 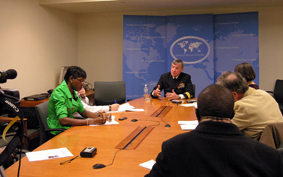 In this Meeting in Washington D.C. in Late March the Role of the APS is being discussed by a Senior Commander for US Naval Forces Africa. Currently in the Second year of Operation the APS (Africa Partnership Station) is a project of AFRICOM (Africa Command). The Purpose of this Program is to build cooperative partnerships with regional Military Forces. The goal is to achieve International Standards when it comes to stablilty and security. Other Programs include addressing challenges such as Unlawful Unregulated and Illegal Fishing, Trafficking and Piracy. Also while the APS is in Cameroon the Crew will conduct Community Outreach Projects as well. Some of these Projects will include assisting Schools and Providing Medical Care for those who need it. Before it ends it Mission in May APS Nashville will visit Gabon.